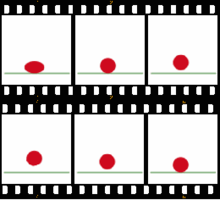 Commonly the effect of animation is achieved by a rapid succession of sequential images that minimally differ from each other. The illusion—as in motion pictures in general—is thought to rely on the phi phenomenon and beta movement, but the exact causes are still uncertain. Analog mechanical animation media that rely on the rapid display of sequential images include the phénakisticope, zoetrope, flip book, praxinoscope and film. Television and video are popular electronic animation media that originally were analog and now operate digitally. For display on the computer, techniques like animated GIF and Flash animation were developed. Animation is more pervasive than many people realise. Apart from short films, feature films, animated gifs and other media dedicated to the display of moving images, animation is also heavily used for video games, motion graphics and special effects. Animation is also prevalent in information technology interfaces. Naruto is a Japanese manga series written and illustrated by Masashi Kishimoto. It tells the story of Naruto Uzumaki, an adolescent ninja who searches for recognition and dreams of becoming the Hokage, the leader of his village. The story is in two parts, the first set in Naruto's preteen years, and the second in his teens. The series is based on two one-shot manga by Kishimoto: Karakuri (1995), which earned Kishimoto an honorable mention in Shueisha's monthly Hop Step Award the following year, and Naruto (1997). Naruto was serialized in Shueisha's magazine, Weekly Shōnen Jump from 1999 to 2014, and released in tankōbon (book) form in 72 volumes. The manga was adapted into an anime television series produced by Studio Pierrot and Aniplex, which broadcast 220 episodes in Japan from 2002 to 2007; the English adaptation of the series aired on Cartoon Network from 2005 to 2009. Viz Media licensed the manga and anime for North American production and serialized Naruto in their digital Weekly Shonen Jump magazine. The anime series began airing in the United States and Canada in 2005, and in the United Kingdom and Australia in 2006 and 2007, respectively. Naruto is the third best-selling manga series in history, selling more than 220 million copies worldwide in 35 countries outside Japan. It has become one of Viz Media's best-selling manga series; their English translations of the volumes have appeared on USA Today and The New York Times bestseller list several times, and the seventh volume won a Quill Award in 2006. DIC Entertainment was an international film and television production company. In addition to animated (and occasionally live-action) television shows such as Ulysses 31 (1981), Inspector Gadget (1983–1986), The Real Ghostbusters (1986–1991), Captain Planet and the Planeteers (1990-1993), and the first two seasons of the English adaptation of Sailor Moon (1995–1998), DIC produced live-action feature films while under Disney, including 1998's Meet the Deedles and 1999's Inspector Gadget. Yeardley Smith (/ˈjɑːrdliː/; born Martha Maria Yeardley Smith on July 3, 1964) is a French-born American actress, voice actress, writer and painter. She is best known for her long-running role as Lisa Simpson on the animated television series The Simpsons. She was born in Paris and moved with her family to Washington, D.C. in 1966. As a child, Smith was often mocked because of her voice and unusual first name. She became a professional actress in 1982 after graduating from drama school and moved to New York City in 1984 where she appeared in the Broadway production of The Real Thing. She made her film debut in 1985's Heaven Help Us, followed by roles in The Legend of Billie Jean and Maximum Overdrive. She moved to Los Angeles, California in 1986 and received a recurring role in the television series Brothers. In 1987, she auditioned for a role in a series of animated shorts about a dysfunctional family on The Tracey Ullman Show. Smith intended to audition for the role of Bart Simpson, but the casting director felt her voice was too high, so she was given the role of Lisa instead. She voiced Lisa for three seasons on The Tracey Ullman Show, and in 1989, the shorts were spun off into their own half-hour show, The Simpsons. For her work as the character, Smith received a Primetime Emmy Award for Outstanding Voice-Over Performance in 1992. The accolades received by Ratatouille, a computer-animated film produced by Pixar and distributed by Walt Disney Pictures. The film was released on June 29, 2007 in the United States as the eighth film produced by Pixar. It was directed by Brad Bird, who took over from Jan Pinkava in 2005. The plot follows Remy, a rat who dreams of becoming a cook chef and tries to achieve his goal by forming an alliance with a Parisian restaurant's garbage boy. Ratatouille was released to both critical acclaim and box office success, opening in 3,940 theaters domestically and debuting at #1 with $47 million, grossing $206,445,654 in North America and a total of $624,445,654 worldwide. The film is on the 2007 top ten lists of multiple critics, including Michael Sragow of The Baltimore Sun as number one, A.O. Scott of The New York Times, Carina Chocano of the Los Angeles Times and Joe Morgenstern of The Wall Street Journal as number two. It was nominated for five Academy Awards, including Original Score, Achievement in Sound Editing, Achievement in Sound Mixing, Original Screenplay and Animated Feature Film, winning the latter one. Ratatouille was nominated for 13 Annie Awards, twice for the Best Animated Effects, where it lost to Surf's Up, and three times in the Best Voice Acting in an Animated Feature Production for Janeane Garofalo, Ian Holm and Patton Oswalt, where Ian Holm won the nomination. It won the Best Animated Feature Award from multiple associations including the Chicago Film Critics, the National Board of Review, the Annie Awards, the Broadcast Film Critics, the British Academy of Film and Television (BAFTA) and the Golden Globes. ...that Joan of Arc and Mahatma Gandhi were protagonists in Clone High? ...that Groundskeeper Willie, a character on The Simpsons, coined the phrase cheese-eating surrender monkeys? ...that Superman stops a mad scientist and his army of robots in the 1941 animated short film The Mechanical Monsters? Yes, we worry about what the critics say. Yes, we worry about what the opening box office is going to be. Yes, we worry about what the final box office is going to be. But really, the whole point why we do what we do is to entertain our audiences. The greatest joy I get as a filmmaker is to slip into an audience for one of our movies anonymously, and watch people watch our film. Because people are 100 percent honest when they're watching a movie. And to see the joy on people's faces, to see people really get into our films...to me is the greatest reward I could possibly get.